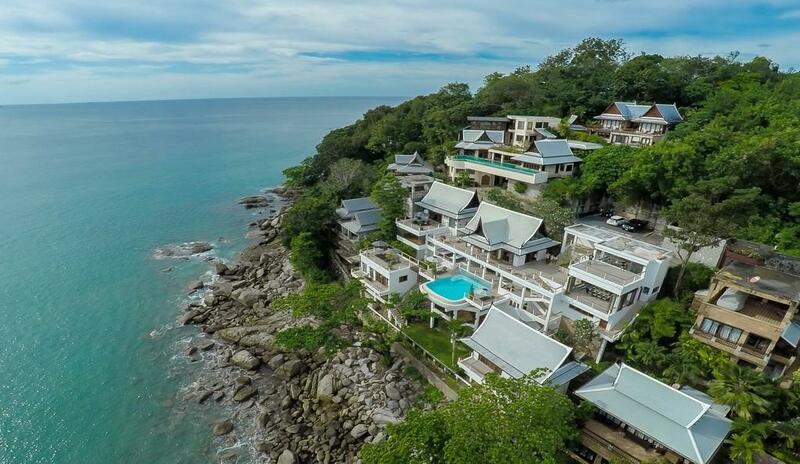 Villa 4541 embraces the beauty of its Ocean-front location, offering the most captivating views over the Andaman Sea. 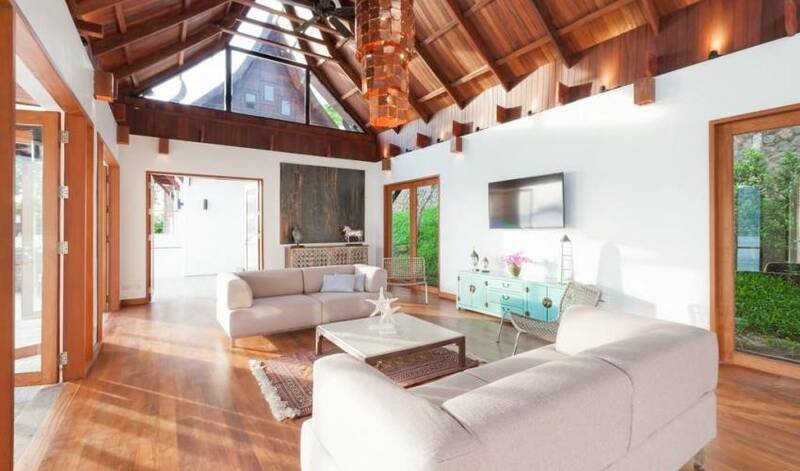 Combining modern contemporary interiors and touches of traditional Thai architecture, this private villa features six bedrooms, each housed in a stand-alone sleeping pavilion. 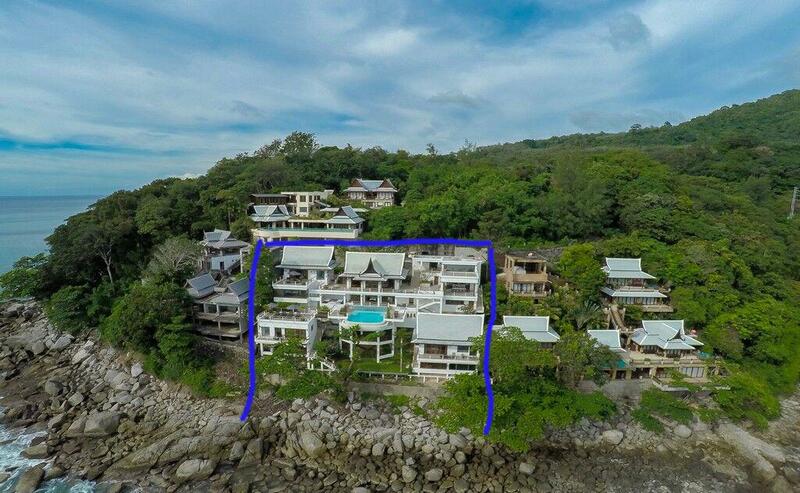 The villa is perched on the headland of Laem Singh and faces south overlooking Kamala Bay. 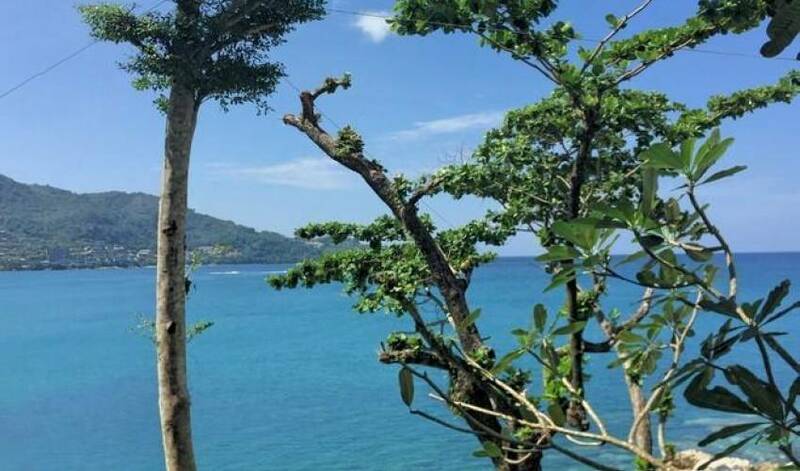 From the ample terraces, the view to the left is of the bright sands of Kamala beach, ahead is the headland of Laem Son and to the right lays the glorious Andaman Sea, glittering and glinting under the light of sun and moon. 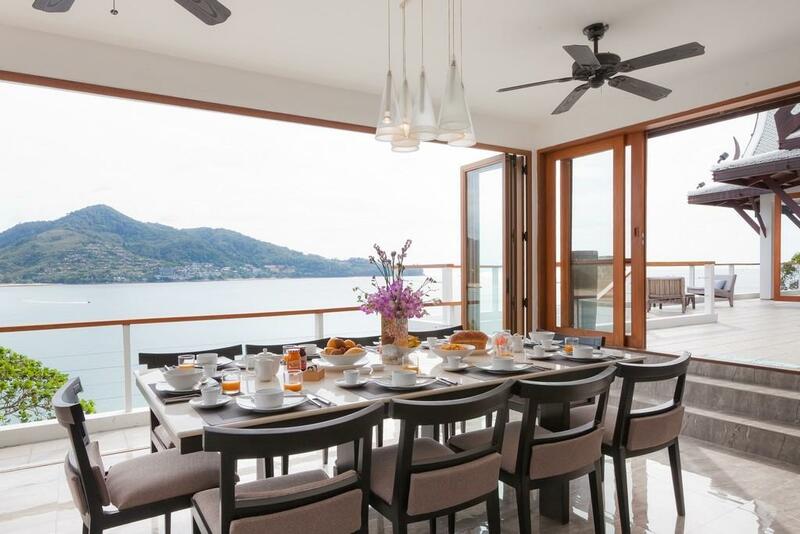 With uninterrupted views over the Andaman Sea, Villa 4541 truly offers an exquisite waterfront location for holidays with friends, family gatherings or corporate retreats. 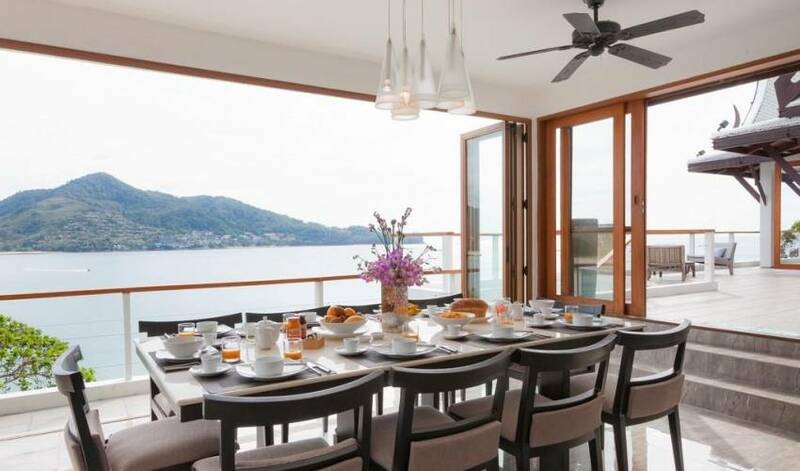 Relax under the sea breezes away from it all, yet with easy access to the happening nightlife and shopping hubs of Phuket. Cut into the steep hillside, Villa Nevaeh comprises a series of Thai-style pavilions, which are connected by walkways and a labyrinth of stairways twisting around the property. Entry is gained next to the air-conditioned Gym on the uppermost level. The room is framed by floor to ceiling glass windows and features a step machine, weights and a bench. For those who enjoy working-out on their holidays, with the view it becomes a pleasurable experience. The Gym room also features a terrace facing the sea perfect for outdoor yoga sessions. Central to the top floor is the Living-room, housed in one of the traditional pavilions. The high roof pitch of this architectural style naturally increases airflow and light into the room. 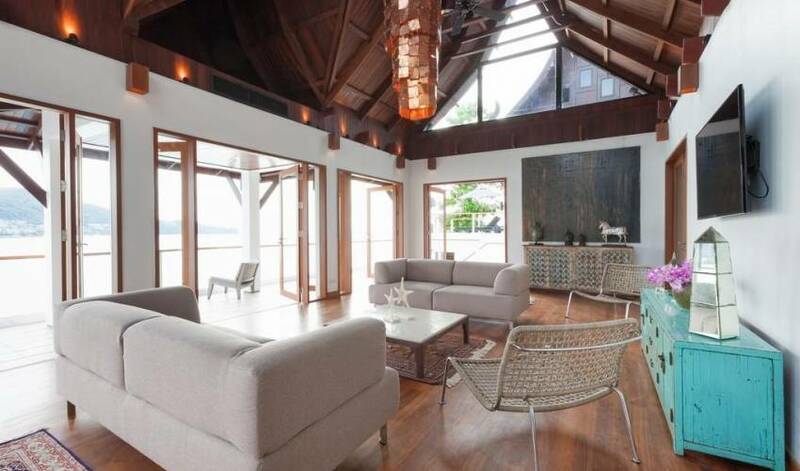 Surrounded almost completely by floor to ceiling length glass windows and doors, this room takes full advantage of the sea breeze which constantly dances through. The blend of modern furniture and traditional architecture is subtle and tasteful, culminating into attractive and harmonious interiors. Ornate Asian artifacts from the owner’s personal collection sit among modern pieces including a unique custom-made coffee table and a master piece chandelier. The living room also features a TV and an entertainment system to accompany guests while they relax on the adjoining balcony and take in the sights. 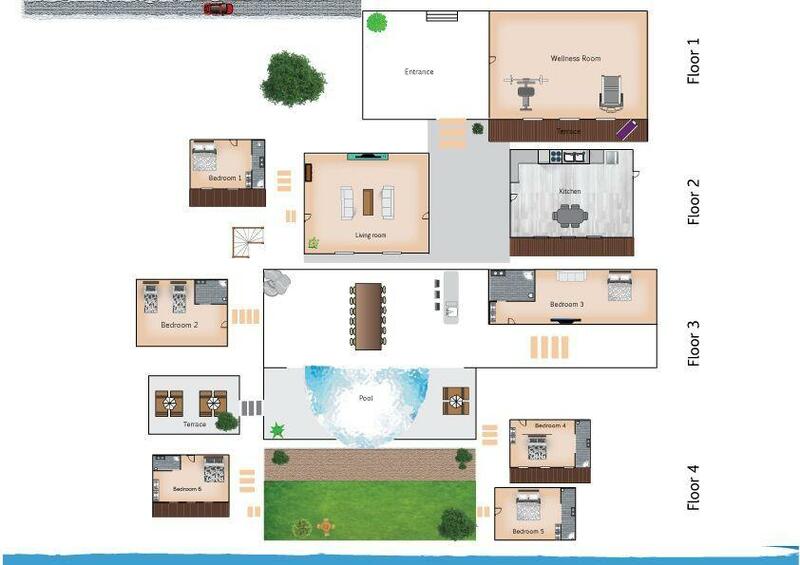 The Living-room is located between the Master Bedroom and the Kitchen. In front of the Kitchen is a formal dining room able to seat up to ten people. The air-conditioned stainless steel kitchen boasts superior modern appliances and a design that facilitates cooking classes. 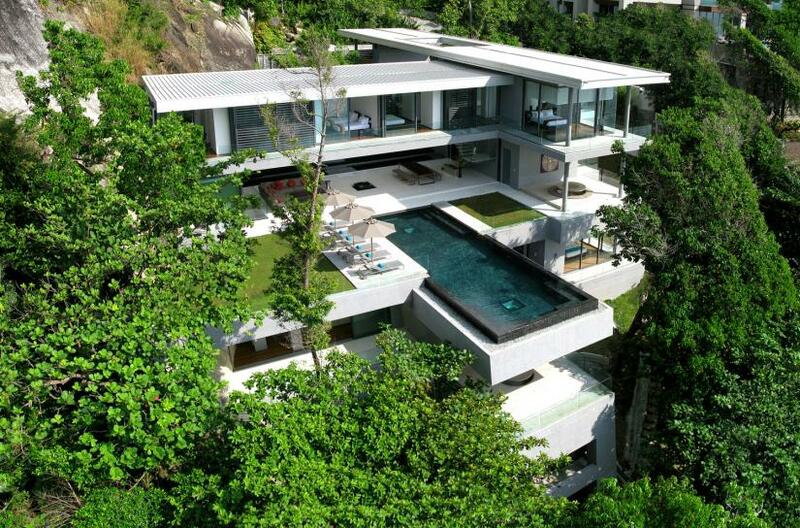 Heading down one level is the infinity-edge Pool. 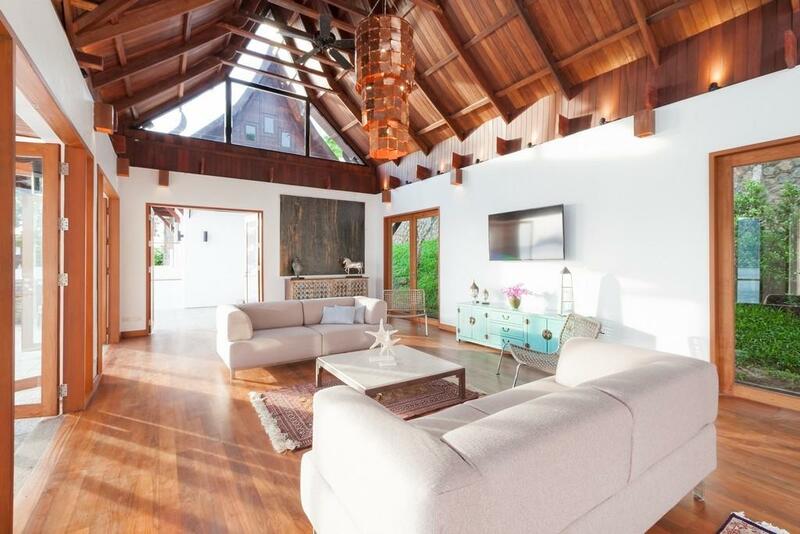 Central to the property, the pool is flanked by a large, open plan Bar/Dining area. Situated right beside the pool, this area is breezy and calming. Leaning against a wall of natural rocks, the Bar/Dining area is the best place to enjoy the sea view while drinking cocktails and listening to music. Adjacent to the Pool and connected by a narrow wooden walkway is a large Terrace perched almost right over the Sea. With reclining sun-beds and umbrellas, this is an idyllic spot for sunbathing. Heading down another level lies the lawned Terrace at sea level in front of a rocky cove. Whether you wish to read a book quietly, listen to the sound of the waves, enjoy a romantic dinner at the water's edge or even organize an intimate ceremony, the lawned Terrace by the sea at Villa 4541 offers a unique relaxing spot. 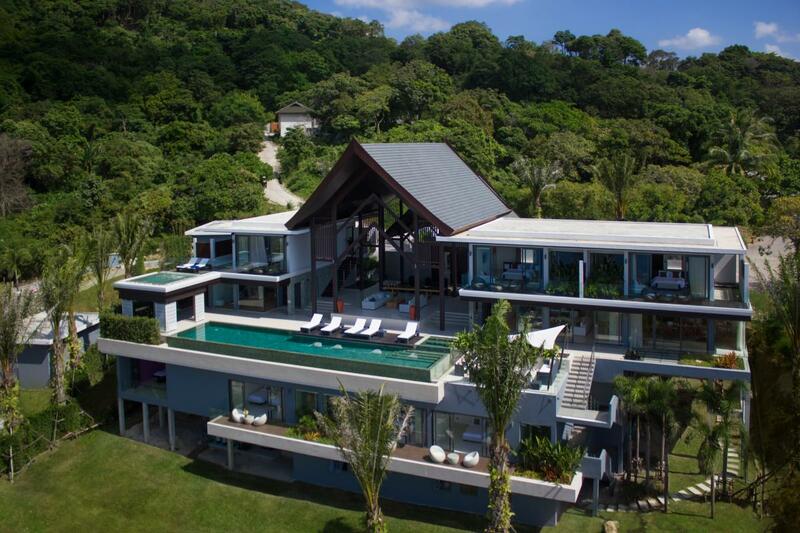 Villa 4541 features six en-suite bedrooms which are housed in separate pavilions. Lavishly furnished, all rooms are equipped with minibar, safes and custom-built furniture. Three of the bedrooms have a seaside balcony ideal to for relaxing. En-suite bathrooms are clad in white and stainless steel with Italian style showers which look out over the bay. All but one bedroom (which is furnished with twin beds) have king-sized beds. 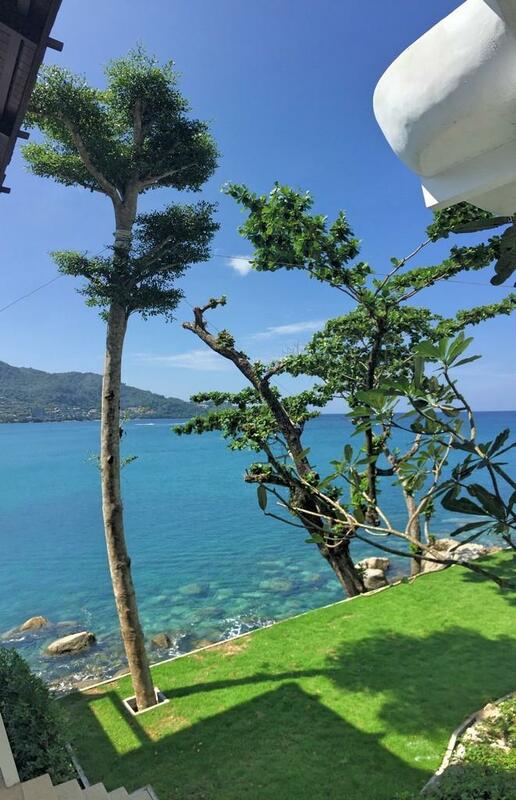 In order to provide guests with every comfort, Villa Nevaeh is staffed by a team of highly capable and trained professionals to provide the highest degree of customer service. All staff members are devoted to facilitating intimate service and to ensure every stay at Villa Nevaeh is most memorable and enjoyable. 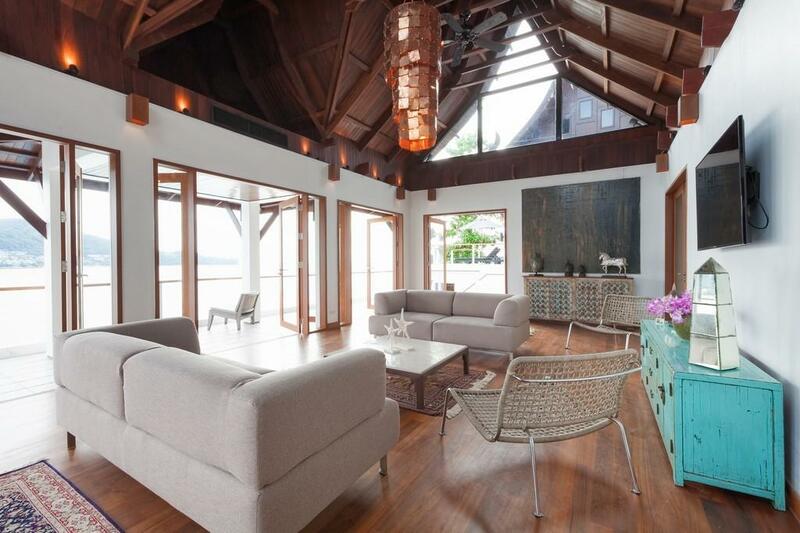 The villa manager is responsible for the overall operation of Villa Nevaeh including staffing, special requests and ensuring guests’ satisfaction. The cook has developed a simple in-house menu of local cuisine. The cooking team is happy to accommodate any special requests or dietary needs. Dinner parties and events can be catered to. The villa comes complete will full housekeeping service. The housekeepers are in charge of maintaining the 5-star standard of cleanliness and tidiness at the villa. The team also assists the F&B team in servings all form of meals or events. They interact less directly with the guests and serve more to ensure the smooth operation of all the facilities such as security, handyman and gardeners. Villa food is home-style Thai food with a small selection of basic western food. The cook would be happy to make recommendations and help you navigate the Thai dishes available in the villa menu. Please remember while the villa’s facilities and staff capabilities are of the highest quality, the villa’s kitchen operates like a domestic kitchen and cannot maintain the same inventory as a restaurant. Thus, pre-ordering is a key component of the villa’s food service. If you have a large group it is advisable that the group dines on the same dish or that you order several dishes to be shared. Please allow at least one day’s notice. The Villa has a menu system with individual price. Should you have a request for a dish not on the menu, or a special dietary requirement, please feel free to ask the cook, who will strive to comply with all of your wishes. Upon arrival, guests will be required to make a cash payment to the villa manager to cover for the cost of food provisioning and cover for food and beverage charges of the first days of the stay. There is a mobile phone available for guest’s convenience to make local calls within Thailand. We provide a complimentary credit of 200 THB. 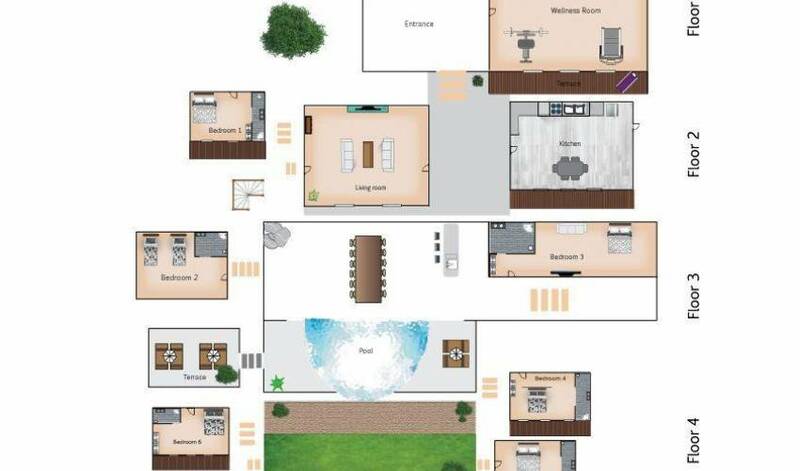 The villa has broadband internet connection. The internet connection is complimentary. The villa is already equipped with essential items for young children such as a highchair and a baby cot. Babysitting services can also be arranged with one day notice (extra cost applies). Please remember that even though the villa staff can provide assistance during day time, guests shall ensure that children are supervised at all times. Be aware that the ground level is not suitable for young kids at all. With its spectacular and romantic ocean-front setting and its ample terraces, Villa 4541 is a dream wedding and event venue for up to 25 people. Please check with us for all costs and conditions.